Above you will find 3 resume reference formats most people use most when they are creating their resume. Go ahead practicing, by editing it, then try editing with different styles, adding bullets to make a list pop out or just to experiment with what you might be able to accomplish with it. 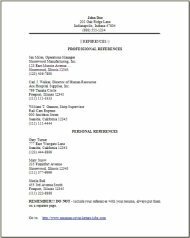 After all, once you edit this reference page with your current work history information, you will start to see the look and feel of it. I trust you may find these examples useful. Try looking over some other pages of resume examples on this website to help you along with more ideas on what to add to yours. 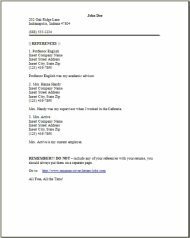 DO always contact any and all individuals that you are requesting to serve on your resume reference page. Always secure their permission Well IN ADVANCE. DO Not ever give out their name as your reference until you have their permission. It does not help your position of getting the job, if that particular employer contacts the person you are using as your reference, and they are surprised and upset that they were contacted. Certainly before you put down that persons name as your reference, do contact that person to make sure they are comfortable and willing to serving in that capacity. You don't want a bad review, so do not assume anything. When you do secure permission, please do not forget to verify all the contact information of your reference to get it right the first time, including the correct spelling of their name, their titles, addresses, telephone numbers and also their e-mail addresses. 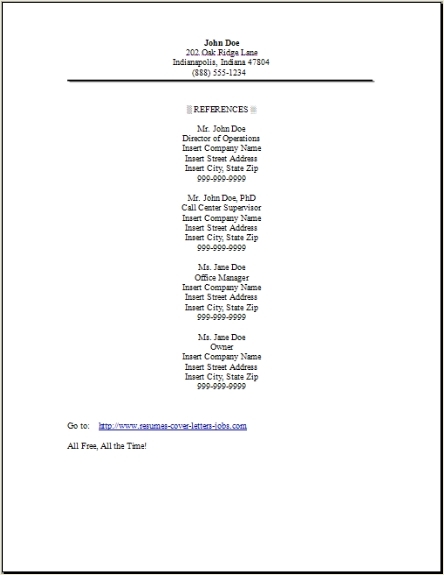 Give every person that agrees to serve on your resume reference page, a copy of your resume. They will then know ahead of time your interests, skills, abilities and your experiences. They will all know your job characteristics, but let each of them know your total background in the work areas you are skilled at. Keep these key people well-informed, as this will benefit you when your references are asked to define you. Try to stay in active contact with them and keep them updated on your progress. Give them the names and companies that you have applied to so they are completely updated. When it's at all possible, e-mail them your job description for the positions you are applying for. This will help all your references to be prepared when contacted. Personally thank each of your references in writing for their assistance. DON'T think of it as bothering them. Keep it brief, and be very cordial during your e-mail and phone messages to show them you are very business like and determined in your job search. Let them know you very much appreciate them as your reference, and you also do appreciate them as a person. Communicating effectively makes it a whole lot easier for your references to understand how to help you.